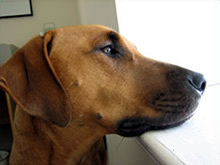 My dog Aviv, a gentle Rhodesian Ridgeback mix, usually attends individual and couples therapy sessions. Clients find his presence both soothing and unobtrusive. He spends most of his time dozing on his mat, but is glad to rest near to you or receive a caress if you would like. Aviv has been coming to the office with me since he turned one year old, and has many years of experience as a therapy dog. Aviv does not attend sessions of clients who would prefer a dog-free session. Aviv is the Hebrew word for Spring, the season. I adopted Aviv from The Washington Animal Rescue League. I am very grateful to have found such a warm and caring companion animal and I am glad to have him with me as I work. He adds a spirit of calmness to my office.